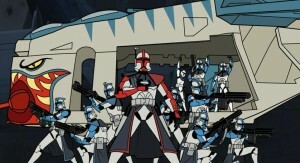 The third season of Star Wars Clone Wars was aired in late March 2005, just less than two months prior to the theatrical release of Star Wars Episode III: Revenge of the Sith. As opposed to the first season and the second season, the third season consisted of five 12+minutes episodes, lasting a little over an hour, which allowed for more plot and character development. 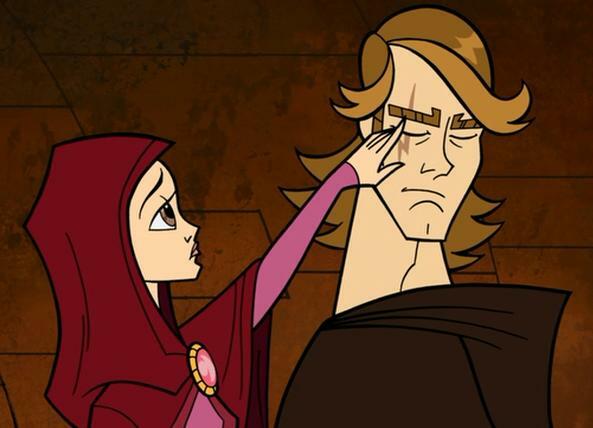 Moreover, there was a little bit more dialogue, which also helped the viewer get a better sense of plot movement, which was tremendously helpful to bring us up to speed in order to finish in somewhat of a cliffhanger, perfectly setting us up for “Revenge of the Sith”. 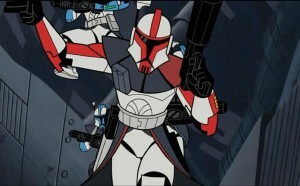 The third season begins with ARC Troopers – yay! 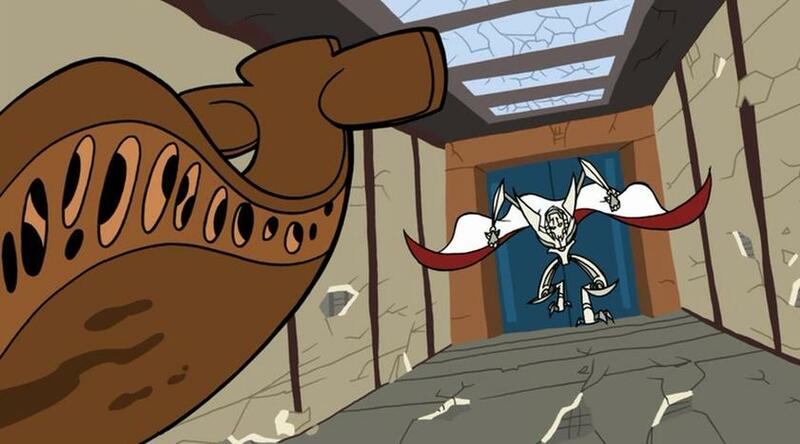 They’re back! 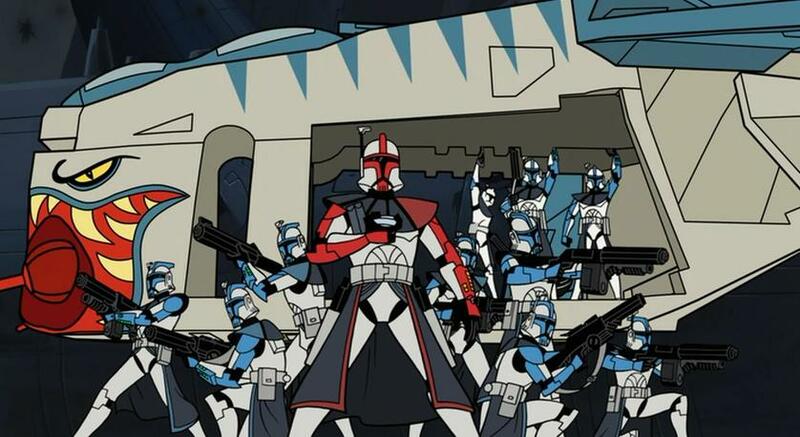 I enjoyed them on Muunilinst in the first season and I was hoping they’d be back. They are just awesome! 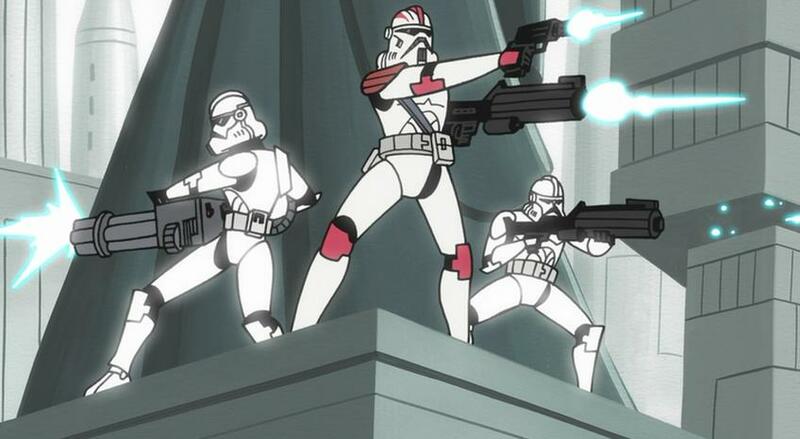 one of the aspects that I think helps make them seem so awesome is the direction in that there is a certain quietness of the troopers, followed by intensity. 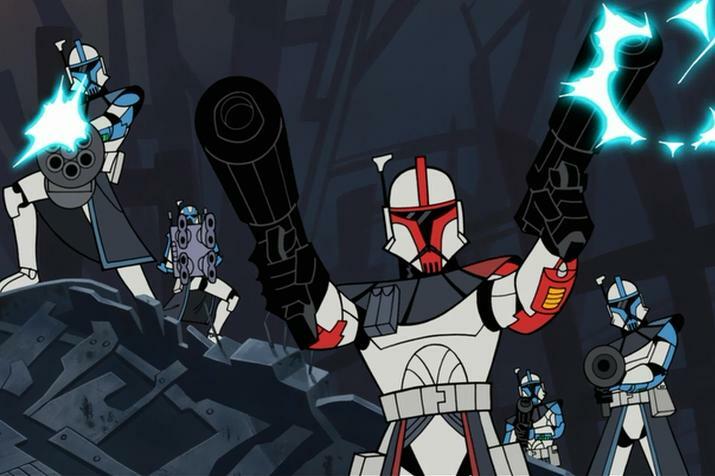 They then arrive with General Grievous fighting Ki-Adi-Mundi, where we had left off at the end of Season 2 on Planet Hypori, just as Grievous disarms Ki-Adi-Mundi of his lightsaber. 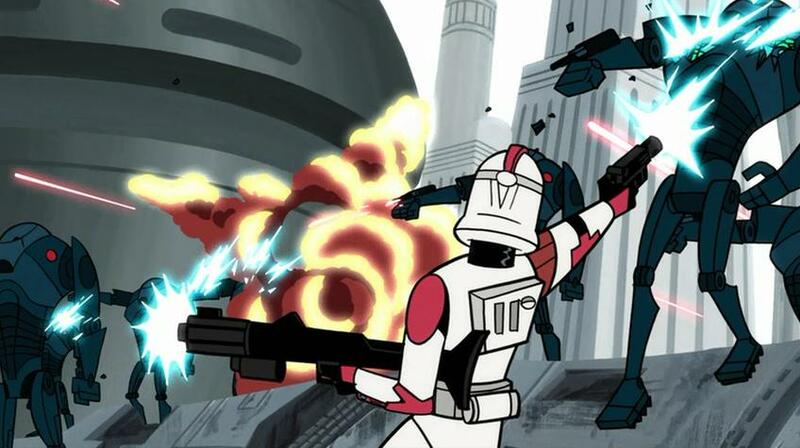 The ARC troopers save Ki-Adi-Mundi’s life by unloading on Grievous. However, he is able to eventually begin to attack them, killing a few (interesting to note that the ARC Troopers die here and some on Muunilinst to battle droid snipers). 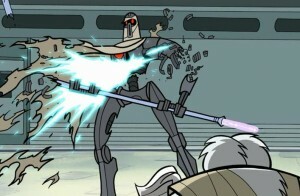 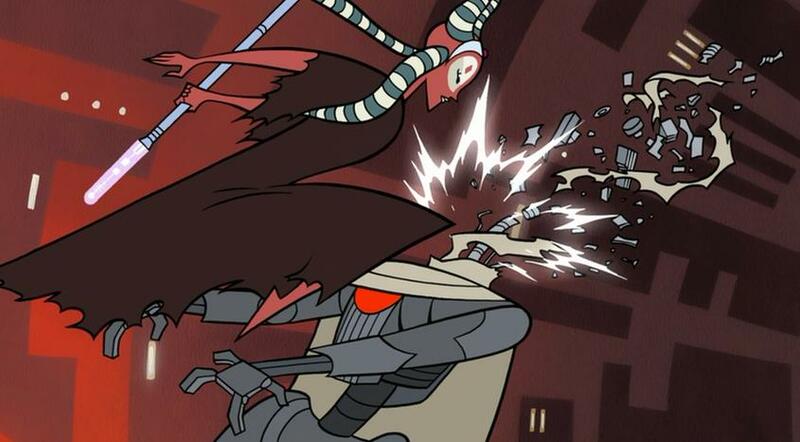 Although they keep him evading their firing at him, Grievous ultimately goes on the offensive until they have their gunship fire on him, forcing him to evade. 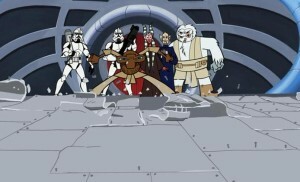 Eventually, they load up the ship, with Ki-Adi-Mundi protesting that they need to go on the offensive, although the troopers say that the survivors won’t make it (“We can’t; the survivors will die. We have no time.”) So, they head off, with just Ki-Adi-Mundi, Shaak Ti and Aayla Secura. 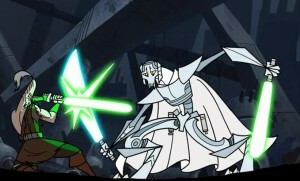 I was glad they were able to survive, although we clearly see that General Grievous is a very serious warrior (as is Ki-Adi-Mundi, by the way, who is able to take him on by himself). 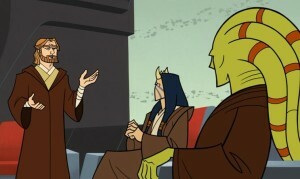 Following on the tail of the previous events, we see the Jedi Council being concerned about General Grievous and the dwindling numbers of Jedi in the war. Then, Obi-Wan Kenobi suggests elevating Anakin from padawan to a full Jedi knight. 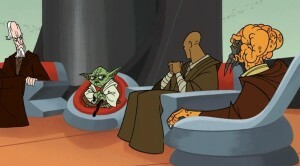 While there are protests and quite a discussion, eventually, Yoda agrees. 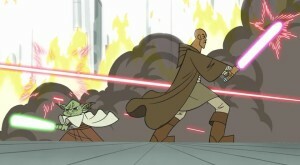 Mace Windu: “I agree. This General Grievous is changing the shape of the war. 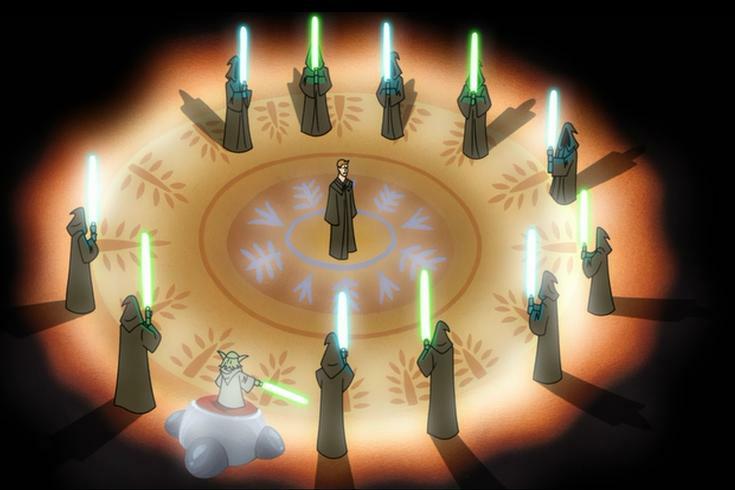 This is an interesting way for Anakin Skywalker to become a Jedi knight: not unanimously and, owing to the exigent circumstances, becoming one despite not fully going through all of the trials. We later see Anakin being called to the Jedi Council by Obi-Wan Kenobi and Anakin is not happy about being scolded for being late. However, Kenobi then leads him to the council chambers, where he officially becomes a Jedi knight. 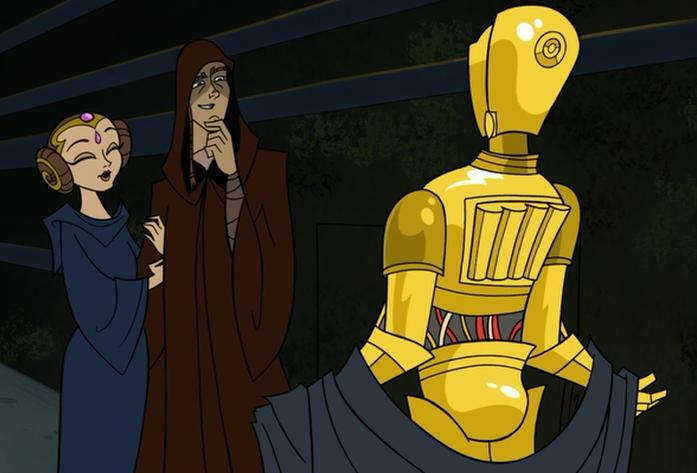 This interaction helps us understand why C-3PO is silver/gray in the first two movies but gold later on…. On another occasion, amidst the many battles in which Anakin is involved, we see Anakin briefly returning to Coruscant to visit Padmé, who sees his scar beneath his right eye (unexplained, but presumably in battle). 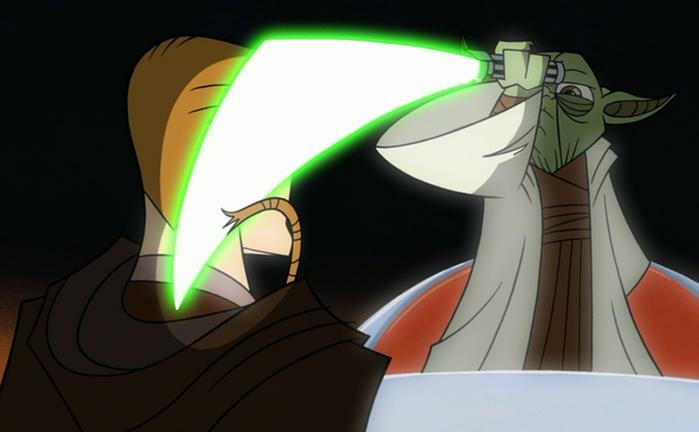 Following Anakin Skywalker’s elevation to Jedi knight, we are shown three snippets of the end of battles in which Anakin is proving his worthiness of being a Jedi knight. 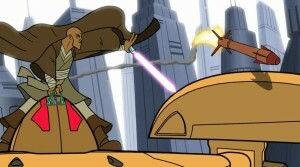 The first of these three shows Obi-Wan Kenobi and Anakin Skywalker fighting side-by-side, masterfully winning a battle. 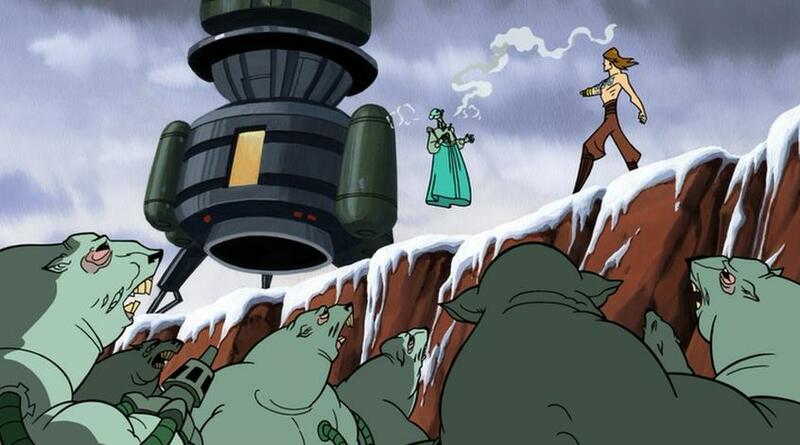 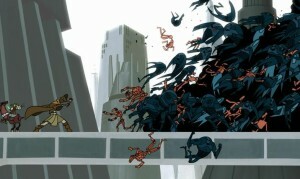 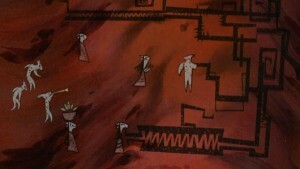 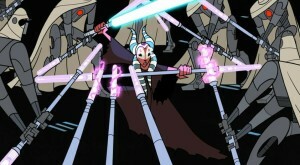 The second shows Anakin helping out a Jedi knight (Saesee Tiin (although, as opposed to our seeing him in the first season, both of his horns are complete)) in space battle, and the third shows another battle in which a few Jedi (Voolviff Monn, Aayla Secura, and Eeth Koth) are struggling and Anakin helps them out. We also see Anakin brilliantly leading Obi-Wan to a secret tunnel and destroying defenses in another battle, allowing them to win the battle in a much shorter time period than expected. Despite the previous successes of the Republic and the Jedi knights, we are also then shown a few scenes of the Separatists making their moves, including an invasion of Kashyyyk, as well as winning on other planets. 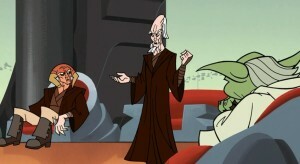 Following their win at a battle, Obi-Wan and Anakin get an urgent message from Mace Windu and Chancellor Palpatine on Coruscant, saying they have some intel on General Grievous’ position (although Windu shares his concern about how dependable the intel is). 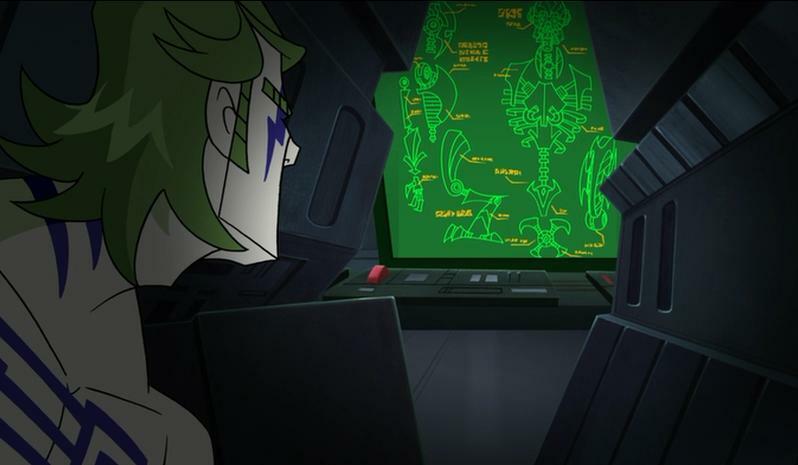 So, they head out on a reconnaissance mission to Nelvaan. While there is a problem on the planet, this is really a distraction from the war. Of significance, Anakin goes on somewhat of a soul-searching mission to save the warriors of Nelvaan from a medical factory of sorts of the Separatists. To be honest, this whole sequence was not only a change of pace of the increasing excitement about the battles and the war, so it slowed things down, which was quite unfortunate, but also my absolute least favorite segment of the series. 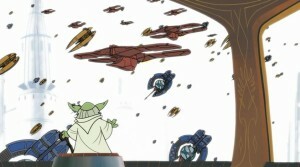 With a surprise invasion of Coruscant, seemingly the completion of the Separatists’ strategy, even Yoda is surprised. We see Mace Windu and Saesee Tiin take to fighter craft – there is not much dialogue, which was not so well done (very simple dialogue), but the action is entertaining. At some point on Coruscant, Windu is involved in a collision and his craft is destroyed, although he hops onto a droid craft and hotwires one of them, which is quite impressive! 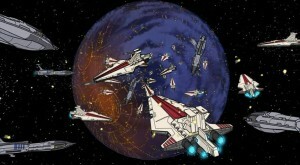 We see Tiin fighting in the space off of Coruscant and doing well, eventually landing on a Republic ship and, along with dozens of clone troopers with special gear, invade and takeover a Separatist ship. 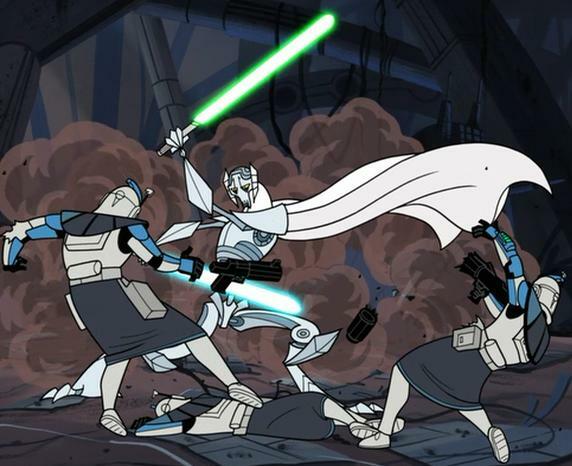 We also see General Grievous reach the Chancellor’s quarters and tries to abduct him, while clone troopers fire on him and three Jedi take Chancellor Palpatine away. 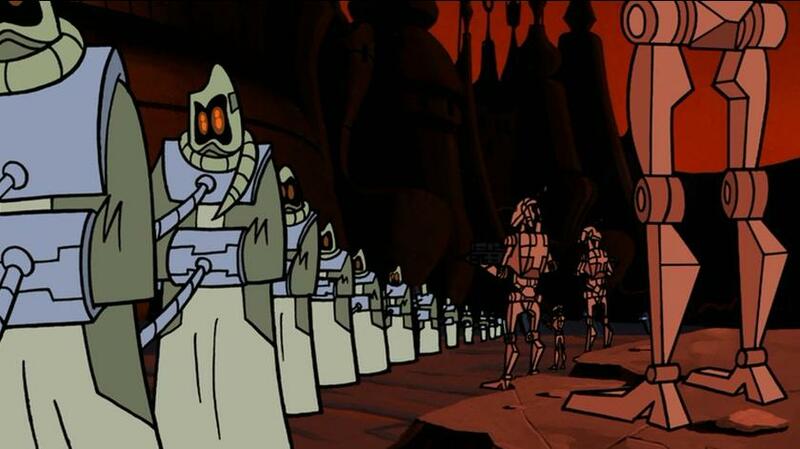 These three Jedi – Shaak Ti, Roronn Corobb, and Foul Moudama – rush him out of the building, only to be met by dozens of super battle droids and General Grievous. 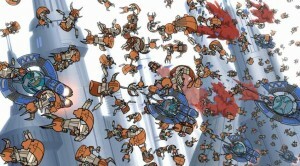 Fortunately, they are able to use Roronn Corobb’s guttural roar to escape briefly. However, the Jedi then try to take Chancellor Palpatine and try to evade mainly the MagnaGuards as well as General Grievous, including even through a train station. The three Jedi are able to get out of the train station and make their way towards a train. 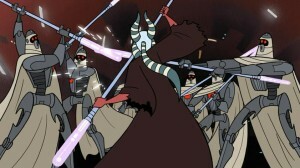 We see Shaak Ti taking on many MagnaGuards, eventually killing most of them, while Roronn Corobb and Foul Moudama take Chancellor Palpatine to presumably a very safe place. 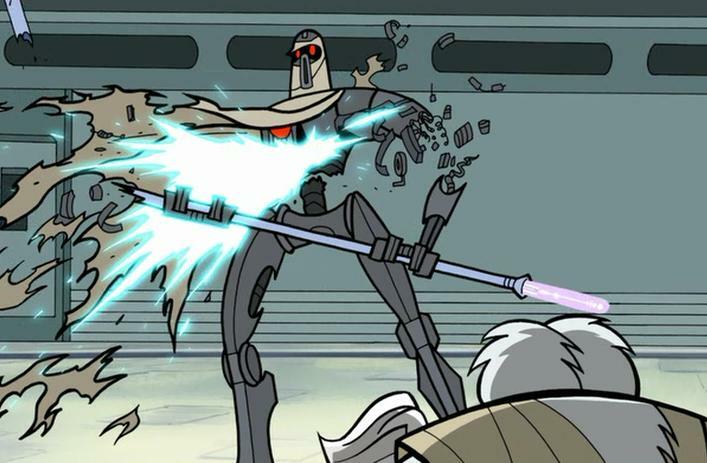 At some point, Mace Windu and Yoda – who are engaged in battle, themselves and doing some really incredibly powerful fighting – realize that the droids are really after Chancellor Palpatine…. 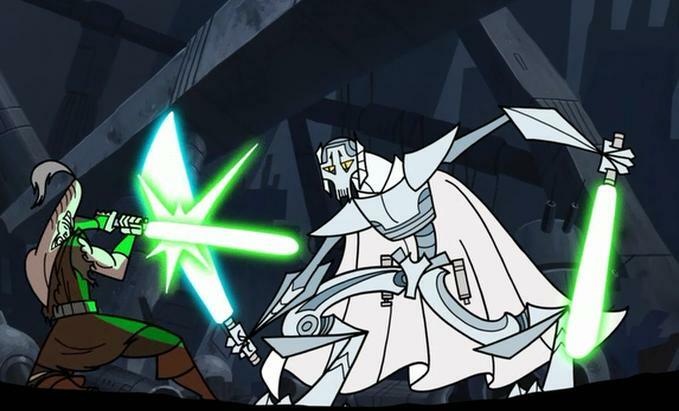 Once Roronn Corobb and Foul Moudama arrive in an incredibly secure and safe place with Chancellor Palpatine, they are shocked to discover that General Grievous is there, waiting for them. Soon, the MagnaGuards leave Shaak Ti, whereupon she realizes that it was a trap for the chancellor and makes haste towards them. 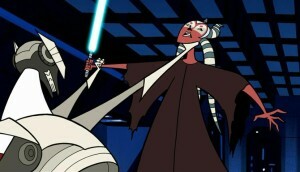 By the time she arrives, Roronn Corobb and Foul Moudama are dead and General Grievous has Chancellor Palpatine. Since Grievous already has the Chancellor, he simply puts Shaak Ti in some sort of trap. 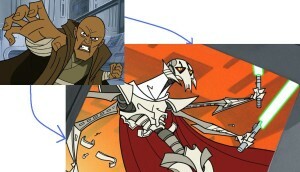 As Grievous is loading up his ship to depart, Mace Windu arrives and successfully crushes his insides from afar, using the Force, causing Grievous to have some sort of breathing problem. 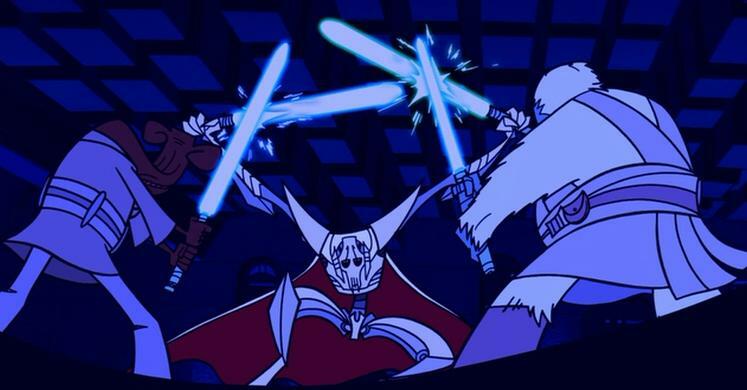 The series concludes with Obi-Wan Kenobi and Anakin Skywalker receiving an urgent message from Coruscant from Mace Windu: “Kenobi, Skywalker, Coruscant is under siege and General Grievous has abducted the Supreme Chancellor. 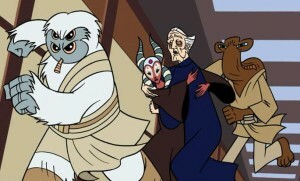 You must return immediately. 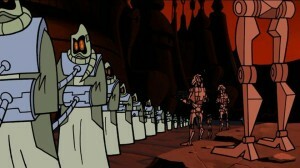 You must rescue Palpatine.” Leading us right on up to the very beginning of Episode III.